Officially today Jakob is taller than me. Is this a reason to celebrate or to mourn the loss of my baby boy? I have about 11 weeks to go and counting before our 6 mouths will turn into 7. A far more Godly number that, number seven. I was recently very encouraged to read in one of the arty design blogs I follow from time to time that the gorgeous Anna Maria Horner is expctting too, number 6! She has been parenting for 17 years and I suspect must have started very early as she looks so young. Check out her blog and see what I mean. Last week I had roasted 2 chickens when family came for dinner and then had to face using leftovers to make soup, chicken pie, chicken sandwiches……I think you can have too much chicken in a week. Here’s to the week ahead with more variety for the ever growing needs of our tribe. 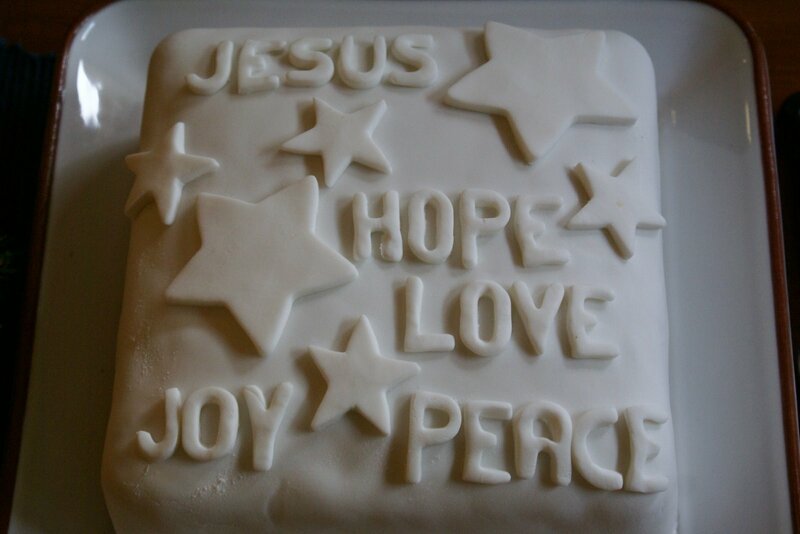 Is it too late to show you my Christmas cake? There is actually still a smidgen left in the pantry. This is the first successful use of my Nigella alphabet cutters. Cookie dough tends to stick in the small crevices of the cutter. Whereas the icing falls out nicely, revealing a letter. Some of us like the cake and others just like the royal icing. So there are lost of requests for the stars. As Lent approaches and we think about Easter I realise that I am not in the habit of Easter baking and gift giving quite like Christmas time. Maybe that should change. Recently a friend shared with me her menu planner – a long list of menu ideas to make her dinner time preparation super easy. When asked for mine I realised I had none…..well no formal list or keepsake. I have instead ideas for food that evolve week to week. These ideas are generally in response to what I have in the pantry and fridge and I guess what I have a hankering for. I thought I would share what was on the list last week to give you an idea. The secret here is frozen prawns and frozen Asian Style Vegetables – no chopping…. simply fry the curry paste, add coconut milk, prawns and vegies and finish with lime juice, brown sugar and fish sauce. Serve with rice. Pan fry pieces of chicken breast and reserve for serving. I use aborio rice, white wine (left overs), chicken stock cubes, sliced mushrooms and asparagus spears. Finish with lots of fresh parmesan and serve with chicken. Butternut pumpkin, sweet potato, a tin of diced tomatoes, tablespoon of green curry paste, water to cover. These ingredients are boiled together and it is seasoned with salt and sugar. I find adding tomatoes to pumpkin soup tends to enrich its colour and taste. Blend/puree soup and serve with cream. Cook the penne pasta. Meanwhile prepare parmesan, tin tuna and olives. Add a jar of Arrabiata pasta sauce and remaining ingredients to the pasta and serve. Marinate stir fry beef strips in soy sauce, oyster sauce, sweet chilli and some olive oil. Stir fry beef and remove. Fry onion, garlic and broccolini add prepared noodles and cook until hot. Add beef and additional sauces to taste. Finish with loads of been shoots for added crunch. What did you have for dinner last week? So Much to Tell You…. How to be a good mother with Sharon Horgan? It's Complicated: The Social Lives of Networked Teens"
slowlifestill Create a free website or blog at WordPress.com.